If you were a visitor to New Orleans and you were wandering down Beale St. this is the exact band and you music you would have had your fingers crossed hoping to stumble across. Opening with the lipsmackin’ and toe-tappin’ Pimp Shoes; the band kick up a right royal funky stomp dedicated to the band members cool footwear. Vocalist Carl Gustafson primps and preens lyrically as a horn section from the Lower Eastside of Heaven brew up a storm as a couple of young ladies sing the sass out of the chorus. This is immediately followed by the hot and steamy Bayou Lady, which soon had me fanning my face; and the honky tonkin’ Don’t Put No Money on Me sounds so seedy I felt like a blushing Maiden Aunt; but the song is a real gem. By the time I came across the glorious If I Died Today; I’d finally recovered my senses as Gustafson competes with a raw harmonica on a sweet Soul song worthy of Sam Cooke himself. Do I have to give a ‘best in show’? I guess so, as I usually do….so let’s go with the cheeky and uproarious Fats Waller meets Thelonious Monk inspired Big Behind which sums the album up in three glorious minutes. Fans of the harmonica; and I’m one will absolutely adore Tell Em’ Shuffle which features the mouthy as a lead instrument on a really swinging rocking Soul track (the funky guitars ain’t too shabby either). The song makes another appearance as the finale; but with an organ and Gospel arrangement – both are doozies! Gustafson certainly knows how to put a song across; especially as his voice sits somewhere between Tom Waits and Van Morrison; but with a funky set of pipes. All of the tracks here are a veritable gumbo of R&B, Soul, Southern Rock and the kind of Jazz your Mother warned you about. 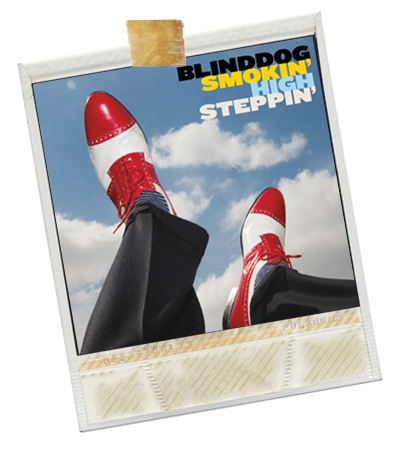 This is Blinddog Smokin’s 11th album and is the perfect soundtrack for a few cold beers, a plate of ribs and a roomful of friends who love smokin’ music.